Let’s be more practical today and learn some advanced accounting techniques. After summaries of standards related to consolidation and group accounts, I’d like to show you how to prepare consolidated financial statements step by step. I’ll do it on a case study, with explaining what I do and why. If you don’t like reading, you can skip to the end of this article and watch my video. If you’d like to revise a theory first, then please read my summary of IFRS 3 Business Combinations and IFRS 10 Consolidated Financial Statements, both of them contain video in the end. Mommy Corp has owned 80% shares of Baby Ltd since Baby’s incorporation. Below there are statements of financial positions of both Mommy and Baby at 31 December 20X4. Prepare consolidated statement of financial position of Mommy Group as at 31 December 20X4. Measure NCI at its proportionate share of Baby’s net assets. Please note here that in the above statements of financial position, all assets are with “+” and all liabilities are with “-“. I use it this way because for me it’s easier to verify and identify mistakes, but it’s up to you. Eliminate in full intragroup assets and liabilities, equity, income, expenses and cash flows relating to transactions between entities of the group. After you make sure that all subsidiary’s assets and liabilities are stated at fair values and all the other conditions are met, you can combine, or add up like items. It’s very easy when a parent (Mommy) and a subsidiary (Baby) use the same format of the statement of financial position – you just add Mommy’s PPE and Baby’s PPE, Mommy’s cash and Baby’s cash balance, etc. In reality, companies use their own format for presenting their financial position and therefore it can be difficult to combine. That’s exactly WHY so many groups use their “consolidation packages” and subsidiaries’ accountants must fill them up along with preparing own financial statements. Therefore, when a group controller calls you every five minutes to remind you the consolidation package, you’ll know why! Of course, there are some strange and redundant numbers, for example both Mommy’s and Baby’s share capital, but we haven’t finished yet! and of course, recognize any non-controlling interest and goodwill. So let’s proceed. The first two items are easy – just remove Mommy’s investment into Baby (CU – 70 000), and remove Baby’s share capital in full (CU + 80 000). As there is some non-controlling interest of 20% (please see below), you need to remove its share in Baby’s post-acquisition retained earnings of CU 9 000 (20%*CU 45 000). Wait a second – how do we know that all Baby’s reserves (retained earnings) of CU 45 000 are post-acquisition? Well, the question says that Mommy has owned Baby’s shares since its incorporation, therefore full Baby’s retained earnings are post-acquisition. Be careful here, because you absolutely need to differentiate pre-acquisition retained earnings from post-acquisition retained earnings, but here, we’re not going to complicate the things. Then we need to recognize any non-controlling interest and goodwill. Mommy has owned 80% of Baby’s share and therefore, non-controlling interest owns remaining 20% of Baby’s net assets. Baby’s net assets are CU 125 000 as at 31 December 20X4, including Baby’s share capital of CU 80 000 and Baby’s post-acquisition reserves of CU 45 000. 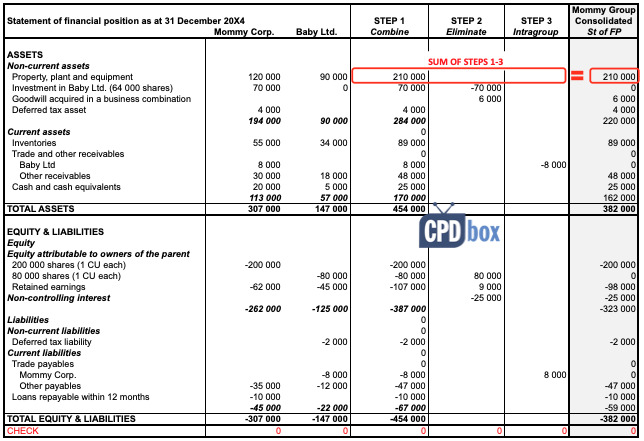 Non-controlling interest at 31 December 20X4 is 20% of Baby’s net assets of CU 125 000, which is CU 25 000. Recognize it with minus, as we are crediting equity with non-controlling interest. There might be some goodwill arisen on initial recognition. If you’d like to learn more about goodwill, please refer to the article about IFRS 3 Business Combinations. Let’s calculate it. Please don’t forget that we calculate goodwill based on numbers on acquisition, not on 31 December 20X4. Add any non-controlling interest at acquisition: here, we’re not adding the non-controlling interest calculated above, as it’s the measurement on 31 December 20X4. At acquisition, the value of non-controlling interest is 20% of Baby’s net assets on its incorporation of CU 80 000 (share capital only). It equals CU 16 000. 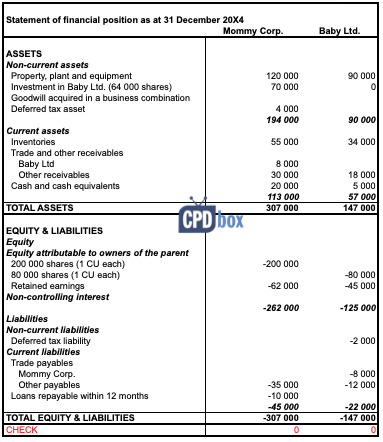 Deduct Baby’s net assets at acquisition: CU – 80 000. Goodwill acquired in a business combination comes to CU 6 000 (70 000 + 16 000 – 80 000). Parents and subsidiaries trade with each other very often. However, when you look at both parent and subsidiary as at 1 company, which is the purpose of consolidation, then you find out that there’s no transaction at all. In other words, group has not performed any transaction from the view of some external user. Therefore you need to eliminate all transactions happening within the group, between a parent and its subsidiaries. After we have completed all steps or consolidation procedures, we can add up all the combined numbers with our adjustments and thus we arrive at consolidated statement of financial position. You can revise all the steps and formulas in Excel file that you can download at the end of this article. Consolidated numbers are simply sum of Mommy’s balance, Baby’s balance and all adjustments or entries (Steps 1-3). Mommy’s investment in Baby’s shares is 0 as we eliminated it in the step 2. The same applies for Baby’s share capital and consolidated statement of financial position shows only a share capital of Mommy (parent). There’s a goodwill of CU 6 000 and non-controlling interest of CU 25 000, as we have calculated above. I know that many of you prepare for your exams and this is NOT the way how you learned consolidation during exam preparation courses. I prefer this way of making consolidation by far, because here, you go systematically, step by step. You can deal with each adjustment in a separate column and as a result, your numbers will always balance. You will never forget anything. The “exam-style” of making consolidated financial statements is good and easy when there are just a few issues or complications. But when you need to deal with more complex situations, then you can forget or omit the things very easily. Trust me, I did it too. However, to make you happy, you can find the same case study solved “by the exam-style” in the attached excel file that you can download in the end of this article. But in most cases, there is lots of issues or circumstances that you need to take into account and exactly their significance and amount makes it all difficult. Consideration transferred for acquiring the shares may involve not only cash, but also some other forms, such as share issue, contingent consideration, transfers of assets, etc. Non-controlling interest can be measured at fair value instead of at proportionate share. There might be some unrealized profit on transactions within the group and it needs to be eliminated. There might be some transfer of property, plant and equipment at profit within the group and as a result, you need to adjust both unrealized profit and depreciation charge, too. Goodwill might be either positive or negative (=gain on a bargain purchase). Moreover, it can be impaired. Subsidiary’s net assets might be stated in the amounts different from their fair value, or even not recognized at all. Subsidiary may show both pre-acquisition retained earnings and post-acquisition retained earnings. You need to be extremely careful in differentiating them and dealing with them separately. I can go on and on, but I don’t want to discourage you. However, if you need to know more about all these issues, I have covered them fully in my premium learning package the IFRS Kit, so please check out if interested. Further reading: Here’s the example of consolidation where a subsidiary has different functional currency than its parent. You’ll learn how to translate the subsidiary’s financial statements. Here, you can learn the opposite process – disposal of subsidiary (deconsolidation). If you like this example and explanations, please help me spread a word about it and share it with your friends. Thank you! Has simplified a huge reading. Great work Silvia!. Thanks a lot. Simple and straightforward explanations. I love the animations too. I find it much easier to remember the steps using the animation. Please keep up the wonderful work. Levon, you have calculated NCI on the reporting date 31 December 20X4 – that’s correct, it’s 25 000. But please, be very careful at calculation of goodwill. Here, you should not add NCI at the reporting date, but ON THE ACQUISITION date, as you’re recognizing goodwill on the acquisition date. Therefore, you should not add 25000, just 16000, as Baby’s net assets on acquisition were just 80 000 (share capital only, as all retained earnings are post-acquisition). Hope it’s clearer now. S.
Yes, that’s correct. It’s the another way of calculating it. Although I prefer taking NCI on acquisition plus NCI’s share on post-acquisition reserves – but that’s up to you. S.
If i invest in only one subsidiary in 2015 that require me to consolidate, what will be the comparative figure? Will it need to be consolidated as well? no, you do NOT consolidate comparatives. The reason is that in the previous period, there was no subsidiary and therefore, there’s nothing to consolidate. You start consolidating only from the current reporting period. Dear Silvia can you please give me email address so i can ask u few question in regards my assignments. another great work Silvia; Keep up! Most slides I see online are complicated, wordy and full of techy jargon that puts many readers off. Again 25% of 125000 is eliminated – which contains retained earnings of 45000. Is it not doing it double? Can you help me in understanding it right? Silivia, You really making consolidation simple! Kudos to you!! – 25% of 125 000 is the full load of NCI at 31 Dec 20X4 – it is NOT eliminated, it is NEWLY RECOGNIZED, just look to the final consolidated B/S. In fact, you are transferring part retained earnings to NCI, part to goodwill (pre-acquisition) and part remains within equity (80% of post-acquisition). Hope it’s a bit clearer. Hi Silvia, if the subsidiary that you are consolidatingissues additional share capital and you share increase from ex. 60 to %75. How do we account for theis and does it have an effect on the P/l of the consolidated financials. Is there an example to show what would happen in year 2 of this consolidation? A has a 60% over a subsidiary B, B has an investment of 25% of C, and A has a direct control over C of 30%. In the solution of this question the A has C as a sub-subsidiary but how this could be. as the effective interest is (60%*25%)+30%=45% this rates indicates that its an associate and not subsidiary. I know may be too late for such example but I am really confused with complex groups and its logic. Wrt. Consolidation of financial statements, what will be the accounting and reporting treatment when one co.has power to control but doesnot have any investment in other co.? the accounting technique is the same as for any other business combination with control, however here, you would have a really large non-controlling interest. S.
could you please explain why there is a goodwill if the subsidiary was incorporated by the parent? I would expect goodwill calculation just for acquired companies. Thanks in advance for clarification. S.
sure, you’re right, but the example says “has owned since incorporation” – maybe parent bought it 🙂 OK, I brought this example due to pure simplicity of explanation and in reality, when someone incorporates subsidiary, there should not be any goodwill, of course. S.
If it’s impaired, would it be common to see an adjustment to the balance sheet impairment? Very simple and nice explanation. May I check with you inter-company balance differences due to exchange difference should go to profit & loss or translation reserve? The share of NCI already includes the portion of retained earnings so is it necessary to shave off the 20% share of noncontrolling interest from retained earning .Doesn’t it amount to doubling. it’s not double counting, because you are deducting from retained earnings and adding to NCI. S.
Thank you very much for your in-depth explanation. Or we just recognize the goodwill at the first consolidated report? goodwill arises on acquisition, so if you are making any report on acquisition date, then yes, you have to recognize it. S.
That’s possible, but I’m not sure what the question is. Can you please specify? S.
well understood Silvia. wish you are my teacher. great topic for the next article. I’ll cover that. But not here in the comments 🙂 S.
Did you write that deconsolidation article yet? I would be interested. Mustafa, if you look carefully to the IFRS Kit, you will find deconsolidation excel file under Consolidation/Group accounts. can I ask what CU stands for? I can’t respond to these questions in a comment, as it would take me too long. It’s all well explained in the IFRS Kit. Best, S.
While Computing Goodwill Calculation in first time acquisition of control, at what value we have to consider the existing investment shares in subsidiary ( Existing investment are 25% shares acquired at 2000 and carrying value is 2500 ). We don,t know the fair value of shares.can we consider the carrying value of investment? Please replay me, Thank you very much. I want to learn more about consolidation process, but I don’t want to buy the whole IFRS Kit. do you sell only the consolidation part? no, sorry, just the full IFRS Kit. S.
Perfect way to explain. God bless you. Sorry, John, terribly busy. Please be patient. Sorry to sound in a hurry. No worries, Thanks a lot for your time and your website! Where do we record/recognised the impairment of Goodwill i.e. if the goodwill is impaired, then the expense/impairment will be recognised in the parent company FS or consolidated FS? Dear Talha, thank you for your kind words. The impairment of goodwill is always recognized at a consolidated level, because in parent’s financial statements, there is no goodwill and the investment in a subsidiary is shown only in 1 line 🙂 S.
Hi Silvia, would like to ask how to prepare eliminating entries in consolidating subsidiaries (partially owned) with capital deficiency? Is it proper to recognize NCI with a debit balance? Kindly give me any reference for my basis. Thank you for your inputs. In some cases parent company and subsidiaries use different financial statement formats to prepare their separate financial statements. Parent company is Manufacturing company. one of subsidiary is bank. here parent company format is different form subsidiary company. 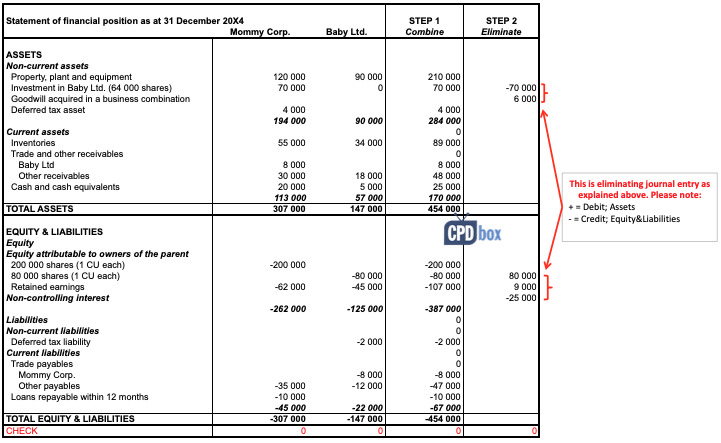 which format should we use in consolidated financial statements. IFRS do not prescribe the exact format of the financial statements and an entity (including group) should select the format it fits them the best, while keeping the minimum requirements. Therefore, you would select the format of the business prevalent in the group. S.
If subsidiary co. issue bonus shares how will be the adjustments ? I have an inquiry. Why the Non-Controlling Interest is calculated at the year end and Goodwill is calculated at the date of acquisition? Thank you. Yes, basically. Goodwill is calculated just once upon acquisition and then it’s tested for impairment subsequently. If there’s no impairment, your goodwill is the same as at acquisition. For NCI, you need to calculated it at acquisition, but also update it at the end of every reporting period. S.
And for the Consolidated P/L Statement how is calculated the NCI for Profit of the year (at year end)if parent has the 80% of subisdiary? if we need to pass eliminating entry for revenue and cost of goods sold then how to eliminate profit in that transaction. example: revenue is 12 and COGS is 10 then whether needs to eliminate 12 from voth side and adjust 2 in profit or elimate 10 from both side and eliminate 2 in profit. thanks for the article. I was looking for such an explanation with numerical example. 1. Will we have to eliminate the parent entity’s investment in the subsidiaries each year as part of our consolidation entries or will we have to do the elimination only in the first year following acquisition but not there after? Why? 2. While there is a general requirement that all the parent entries must consolidate the financial statements of subsidiary over which they have the capacity to control, there is an exception for “investment entities”. What is the basis of this exception and do you think it is a justifiable exception? 1. You have to do it all the time, not only the first time – you need to repeat this entry. The reason is that there is no investment in a subsidiary from the group’s point of view all the time, not only right after acquisition. 2. The reason is that the main business of the investment entities is to earn money on dividends or movements in the share prices on the market and NOT to exercise control over subsidiary. From this perspective it has more sense to see the fair value of all investments held by the investment entity, rather than see the aggregated assets and liabilities. So yes, I think it’s a justifiable exception. S.
I have 6 companies to consol with mixture of different currencies. But for consol report, it is fix at USD. I hv 2 co. with RM and GBP currencies. So on consol level, when i did at USD, my consol balance sheet s forex reserve due to translation. However, i couldnt get to balance the BS at consol level. I suspect due to RM co. with have non-controlling interest (share capital & share premium), do i need to any adjustment? A company “A” has booked purchase from another company “B” in the year 2014 when they are unrelated, but no sales was booked by company “B”. In the year 2015 both companies A and B were acquired by another company “C”.The individual balance sheets and both companies are already audited and auditor skipped to rectify the un- reconciled sales and purchase between “A” and “B”. Now while consolidating the balance sheet of “A” “B” and “C” in the year 2015, what effect shall I give to rectify the receivable and payable difference? Can I adjust it with the retained earnings in the consolidated balance sheet? A very lucid and handy explanation of the hard-to-understand concepts. Thank you very much. Have a Consolidation sample for Holding company with foreign subsidiaries? I want to know exchange difference on inter-co transactions (e.g loan bwetween holding & subsidiary company, sales & purchase, how to make elimination in Consolidation? In accordance with IAS is the goodwill arising on acquisition appears at the individual S.F.P, or it is already included at the investment account ? Hi Coop, goodwill is not recognized as an asset in the individual statement of FP. Instead, you keep investment either at cost, using the equity method or as a financial investment under IFRS 9. S.
2) when Parent company invest in subsidiary with only assets as consideration transferred at acquisition, so when we prepare the later consolidated financial position shall we eliminate the capital gain in parent accounts? 3) how we record the broker fees when parent acquired subsidiary stocks from deal in market. 1) Is this necessary? When a parent provides the services, P shows the revenues and S shows expenses – these are both eliminated at consolidation, so there is no unrealized profit to eliminate. 2) I assume you mean the difference between the fair value of assets given up and their carrying amount. No, you should not eliminate it, because this is not the transaction with a subsidiary – it’s a transaction between the parent and the previous owners of that subsidiary. 3) In the consolidated financial statements, these are expensed. In the separate financial statements, the transaction costs are a part of the cost of investment. Many thanks Silvia, I understanding from you there isn’t unrealized profit for services (just for stocks), is that right?! Yes, Haytham, because you don’t have anything left in your balance sheet when you buy/sell a service (however, inventories can remain unsold). S.
But, please it that capital gain on fixed assets shown in financial statement even the Parent ESTABLISHED the subsidiary with other investors. My question about calculating the consolidated cost of sales, where there is an intra group transaction (downstream),and time apportionment. the question is :why the intra group amount of subsidiary purchases is not eliminated first before time apportionment, and then only the remaining will be time apportioned? That because, if we did the time apportionment for the all cost of sales amount,that we means that we apportioned the intra group, which should have been entirely eliminated before the apportionment? as you know, you eliminate intragroup profit only on those purchases (intra-group sales) that relate to inventories still in the warehouse (unsold by the group to third parties). You may reasonably assume that this relates to the latest purchases/sales in the reporting period. That’s why you first time-apportion and only then remove intragroup profit. However, let’s say that P acquired S in June and the last intragroup purchase happened in May. At the year-end, inventories are still unsold. In this case, you do NOT eliminate any intragroup profit, because this intragroup purchase is NOT intragroup – it happened prior acquisition. I hope it’s clearer now. S.
Hi Silvia, first of, would like to commend you for such an excellent website you have. I’ve found it extremely resourcesful and your explanations are enjoyable! I have a question regarding consolidation of group accounts as an on-going month-end preparation. After the consolidation above, what would be the practice in a real-life situation during every month-end? Will these steps be redone every month? Thanks so much in advance, you are a superstar! Good presentation. Kindly do the same for statement of financial performance, especially first year consolidation. I would like to know, if the parent company acquires 100% shares by way of making payment to the shareholders, initially what would be the entry in subsidiary books and then at the time of consolidation, at what value would the investment in parent company and share capital in subsidiary be shown. If for eg, Parent company acquired 100% shares at price of .50 paise where the share price of subsidiary is rs. 10 each for 1000 shares. First how would be the share capital shown in subsidiary balance sheet. Will it be shown as 10000 Rs. or Rs.500 in share capital account. Second, Investment in Parent company would be shown as Rs. 500 for 1000 shares. 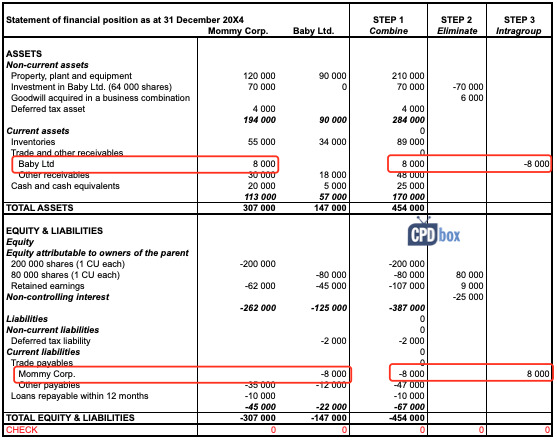 So at the time of consolidation, how would the books and balance sheet be shown. when parent acquires the shares in subsidiary for cash, it does NOT affect subsidiary’s accounts. It still remains the same. The parent’s investment will be shown at Rs. 500 for 1 000 shares. Then at consolidation, the investment of Rs 500 cancels out agains subsidiary’s net assets and if there’s something left, it’s goodwill. S.
Completamente de acuerdo, yo diría que es impúdica. Raya lo ofensivo, la verdad. I can’t thank you enough for your articles and for the IFRS kit! It’s the first time someone teaches me IFRS the way it is actually done in practice! The case studies in excel are just great. I initially needed only a consolidation refresher but I got so excited that I will follow the entire course and I will aim to pass dipIFR sometime in the near future. In group consolidation, how we may compute the value of goodwill if the consideration paid are in shares or any other assets rather in terms of liquid cash. in this case, you need to determine the fair value of consideration transferred – i.e. the fair value of the shares or any other assets given up in return for the investment. S.
Thank you so much for ur response. I do Appreciate ur effort. Could you please get me clarifications on the below points. 1. 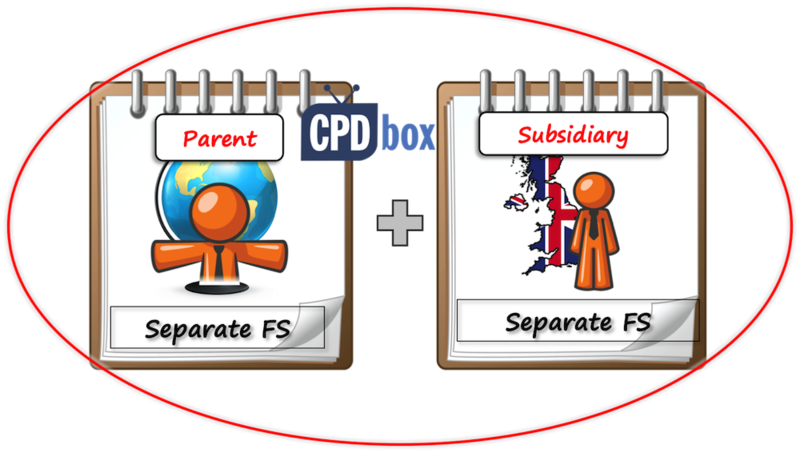 What would be the reason behind recording Parent’s share plus Subsidiary’s share(for instance 80%+20%) in the CSOFP instead of 80% Parent’s alone! 2. Unrealized Profit – could you please explain how & under what all circumstances does it generates ! Why are we using the word “net assets” to the above figures corresponding to (a,b,c,d & e) ? 1. Because a parent controls the whole subsidiary, not just 80% of it. That’s why you show non-controlling interest – to report that although the parent controls 100%, 20% is owned by someone else. 3. Because the sum of these numbers EQUALS the net assets. The basic accounting equation is that Assets = Equity + Liabilities; hence equity = assets – liabilities = net assets. S.
3.the question is why we aren’t calling it as equity instead of net assets since it covers the elements of equity only. May I ask a question on PPE please. If subsidiary has different policy from parent – subsidairy values PPE at cost , but parent revalue PPE subsequently. How do we consolidate the PPE line please? a parent and a subsidiary must apply the same accounting policy. Therefore, before consolidating, a subsidiary should adjust its accounts so that PPE is valued using cost model as its parent. S.
This is a great article. Thank you for putting it together. What would be the journal entries in the books of Mommy Corp. and Baby Ltd. if Mommy Corp. were to acquire a 100% of NCI? I don’t understand fully. Are you asking about the situation when non-controlling interest is 100%? So in this case, Mommy owns zero, but it can still be necessary to consolidate, because Mommy could still exercise control over Baby (not based on ownership, but based on something else). Also, as Mommy acquires 0 in Baby, then the goodwill is equal to the investment of CU 70 000. The journal entry would be therefore Debit Goodwill 70 000, Credit Investment 70 000, Debit Share capital of Baby 80 000, Debit Retained earnings of Baby 45 000, Credit NCI 125 000. It may seem strange, but similar situations happen a lot with special purpose entities. S.
I just wanted to say THANK YOU for your amazing resources on this website. I used them to revise at the last minute for a job interview at a huge company with many complex consolidations and they offered me the position even though my actual experience in acquisition accounting was limited. amazing, congratulations!!! 🙂 I’m happy to be a part of your success 🙂 I hope my web will help you in your new position, too! S.
Thank you for this very informative example. But I do have one question concerning consolidation. IFRS 24 requires entities to consolidate their statements regardless business activities are same or not. So can you please tell how can a production company’s financial statements be consolidated with its subsidiary’s fin. statements, when the subsidiary is a bank, insurance company and etc. It is simple and clear for apply. Hi Violeta, it reduces the cost of investment. I’m a Software Programmer working for an accounting firm. This article has answered so many questions that I couldn’t figure out even after hours of google search and book reading. Thanks for the simplifying the concept. Great, I’m glad to help 🙂 S.
Thank you for making it easy to follow. Now I can get that consolidated statement of financial position balanced every time. I would like to know, if Company A holds 60% interest in Company B Company B had non distributable reserves which was consolidated as 60% inclusion and 40% as NCI in 2016, in 2017 the NDR converted to share capital. How will this effect the consolidated AFS in 2017? Should the Parent company purchase the final say 20% of a sub what happens to the accummalated MI reserve to date? Just want to know, what steps are taken to consolidate the balance sheet of 100% (wholly owned) subsidiary. Are we need to eliminate equity and transactions only? Please help. Thanks for your amazing explanation. Can I ask something, please? Why does Baby’s share capital need to be cancelled/eliminated ? Hi Helen, because from the external point of view, there is just one share capital of the group – the share capital of the owners of the group. S.
Hello, thanks madam Sylvia for the wonderful articles about IFRS. hmmm, I don’t think I understand your question fully. The example assumes that you know how many percent you acquired…S. Thank you for the post. Can i ask about consolidating other financial statements apart from statement of financial position. is it just simply adding revenue and cost or is it required any adjustment like this? Hi Amy, great question. I’ve just realized that maybe I did not cover it up here, so I’ll do it in the future. Yes, you do need to adjust, too – but not that many adjustments. You still remove intragroup sales/cost of sales. I have published one example on consolidated cash flows – maybe this helps. S.
Hi silvia, can i ask u question about consolidated statement? I liked your simple and effective way for presenting this complex subject. I rate this as one of the best I have come across. Thank you. Very good explanation. Thanks! I wonder how you arrived at non-controlling interest of 20% ? Shouldn’t this be 12.5% ((80000-70000)/80000) ? NCI = 20% – it’s what the parent does not own, i.e. 100%-80%. What if the subsidiary makes a redemption of its own shares and let’s say that 5% of the shares of the NCI are redeemed, how will this be shown in the consolidation of the parent? Thanks a lot for your so simple and well explained Summaries. How can I purchase the IFRS Kit? Hi Rochell, you can do so here: https://www.ifrsbox.com/ifrs-kit – simply click “Get Instant Access” on this site. S.
I have a question regarding the unrealized profit I would be grateful if you could help. What happens, when one subsidiary A (producer) sells inventory to another subsidiary B for whom the inventory is PPE. I understand that the profit will be eliminated the first year when consolidating the statements by the Parent company, but what happens afterwords?? Should the Parent still continue ignoring the depreciation charge of the PPE in the amount of the unrealized profit? Could you please explain. how am i calculate the nci of any group. If Parent acquires 100 % of Subsidiary’s share,does parent require to consolidate parent’s FS. If parent company is formed during the year and acquired a subsidiary during same year. When consolidating is there any special things to take care ? and when disclosure all the balance of subsidiary should be shown under additions or opening balance? I cannot thank you enough, Silvia. Good job on Group Accounts. I have given an assignment to do a business evaluation report and I am confused on the structure or the content of the business valuation report. Thank you for these. I work for a big 4 accounting firm and consolidation is always a challenge. I have a the following dilema. I work in company A (Romania) that has as an investor an investment entity ( H(olding) – from Austria. A company has 2 subsidiaries ( 100% in both) B ( Czech) and C (Germany). Until now we consolidated in company A (Romania). At the end of 2018 the board intends to bring companies B and C under direct control of H, meaning that A will sell to Holding the 2 subsidiaries. From 2019 who and what will consolidate? As far as i undestood from IFRS 10 Exceptions, the investment entity does not need to prepare consolidated FS. But who will present the activity of the grup?Will the consolidated FS be done only with companies A, B and C, or also with H? it depends who exercises control of B and C after 2018. If it is investment entity and A loses control of B and C, then yes, investment entity H must assess whether to consolidate or not. There are some conditions when investment entity is prohibited from consolidating subsidiaries and when it must consolidate (it is not automatic). If H is prohibited from consolidation and gains control of B and C, then H shows B and C under IFRS 9, not under IFRS 10 (investments at fair value, not consolidation). It can happen that only ownership share is transferred to H, but control stays in A – in this case, A consolidates (similarly as consolidating special purpose entity). So first, you need to perform some assessment of the situation and control, then analyze the exception of investment entity (whether applies or not) and then decide. S.
please provide me your email. Hi Luke, there is a contact form to write me an e-mail. S.
I have a question regarding the impact of IFRS 15 on group consolidation. Consider two companies A and B who each have their own contract under IFRS 15 with the same customer. At consolidated level, though, the two contracts have the same commercial purpose ( example an IT project that is partly delivered by the US subsidiary and partly delivered by India) so based on IFRS 15, they should be combined. Is it ok to combine these contracts into one single contract and redo the allocation at the consolidation level? As a result, the consolidated retained earnings account might not be equal to the sum of retained earnings accounts of the two companies. Thanks for this articles. Your work has been of great help to me. If parent determined the fair value of such security using income approach at CU 100 and for the same security in Co. A subsidiary determines fair value using market approach at CU 130. Is alignment required in consolidated financial statement? Or can this be allowed on the basis that fair value is an accounting estimate? Requesting some clarity in such scenario. i would like to more and more. Interested to receive updates regarding this. During the consolidation of my subsidiaries and parent company A/C, i face below problem and want your kind support.. Let The the parent company is “X” and there are two subsidiaries “Y” & “Z” and X holding 99.5% share of Y & Z, and also Y holding 1 % share of Z. Now I am confused how can i eliminate the investment of Y in Z share during the consolidation.